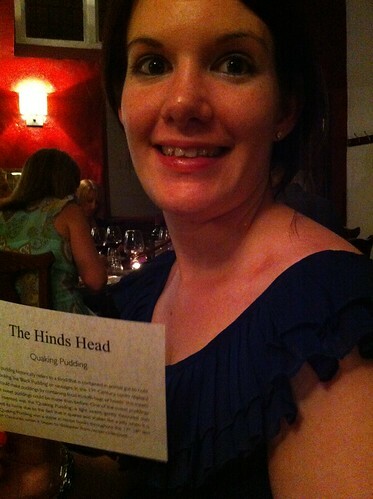 What better place to go after a good day of racing than The Hind’s Head in Bray? 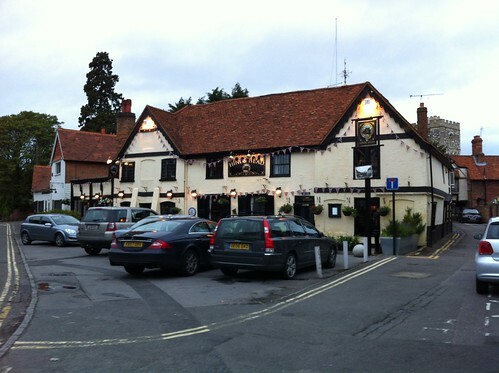 The Hind’s Head is Heston Blumenthal’s pub, so when I realised how close it is to Ascot, I suggested a trip there! 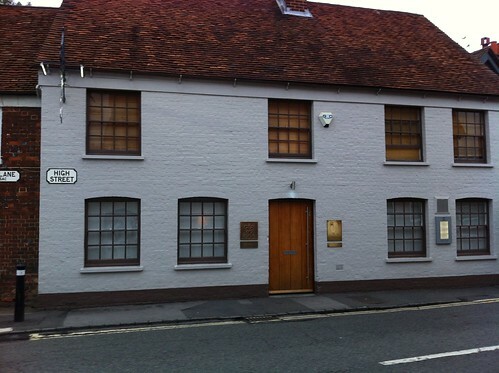 Luckily, we were able to get a reservation, and arrived a little early to wander over the road and check out The Fat Duck, Heston’s more famous restaurant. It looks incredibly unassuming from the outside! You can’t peer in through the windows, which is great news for the diners, but not as fun for us gawking tourists. But this one doesn’t need a lot of fancy detective work to figure out! 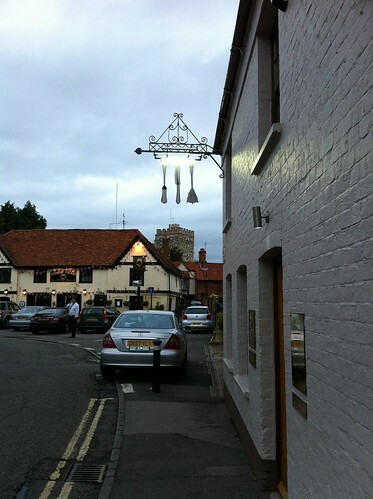 Here is the famous Fat Duck sign, and in the background is The Hind’s Head! 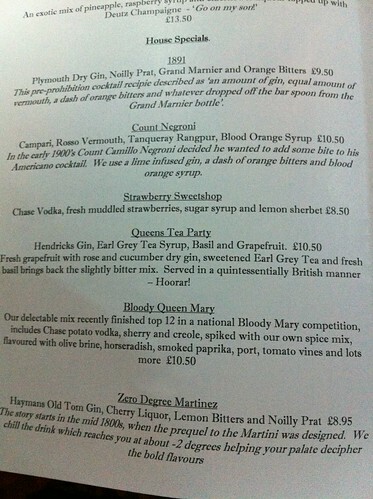 The first thing we did went we got in was order a drink from the amazing menu while we waited for our table to be ready. 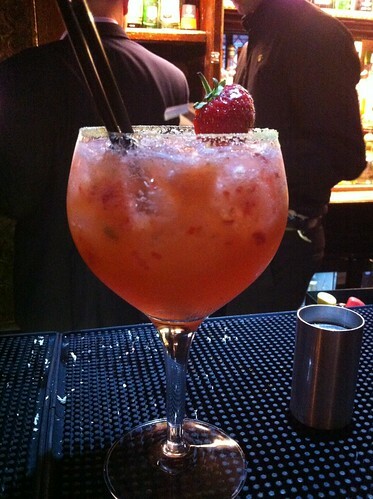 They were hugely expensive, but I spent my returned stake money on the strawberry sweetshop, and I don’t regret a thing! Delicious! 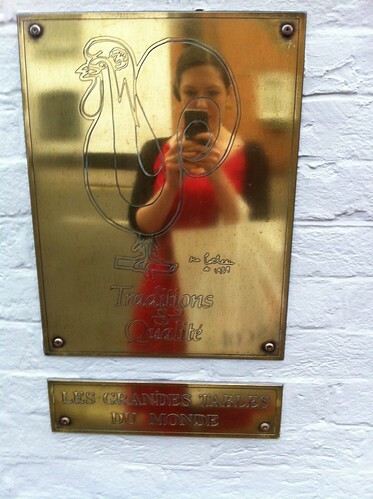 I would also have really like to have tried out some of the historical punches… but, a girl’s gotta eat, too. 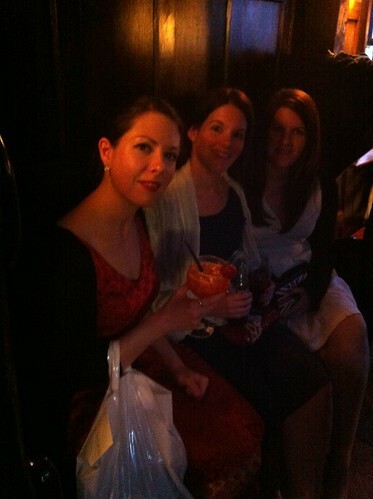 We supped our drinks, and by this point had removed our hats – not really pub wear, even in Bray! I had to try these as everyone was raving about them, and they were delicious (and cheap, too *ahem*…). 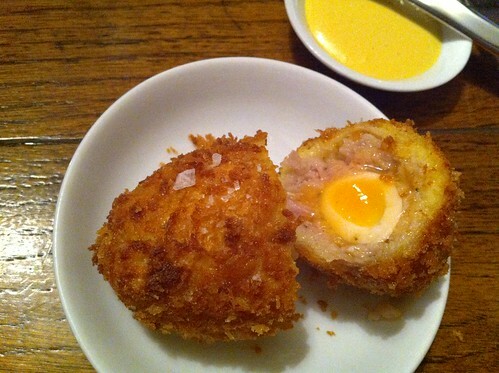 The quail’s egg in the centre was still runny, and the pork was incredibly rich. The coating was deliciously crisp. 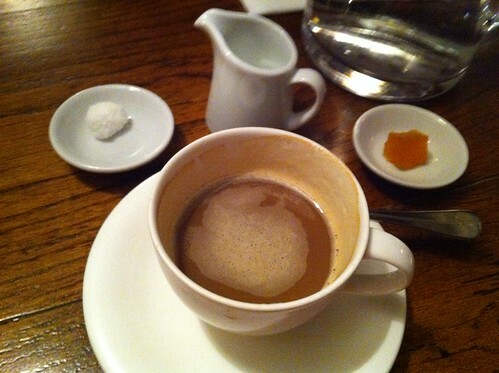 There was certainly more than enough, even though the portion was small. For my main, I had the steak and kidney pie (with triple fried chips, because. 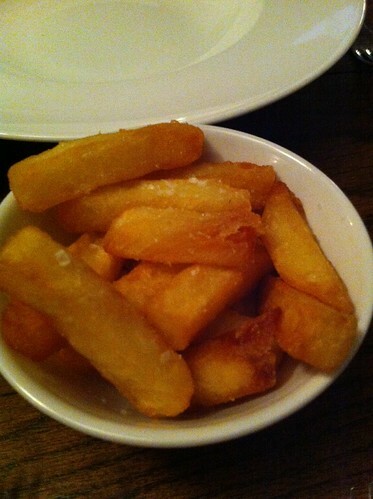 Chips). 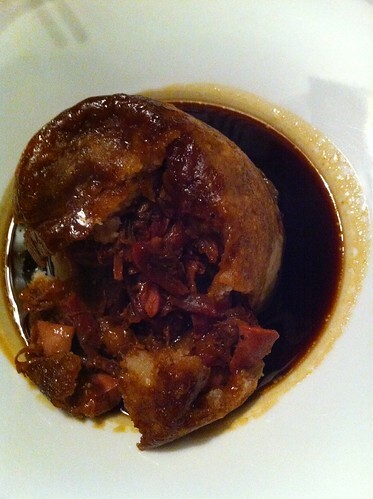 It was tender, delicious, and very, very rich and savoury. Yes, I know I decided against the steak because it was a familiar thing, and so is steak and kidney pie, but I wanted to see what Heston would do with the traditional recipe. Needless to say, they were great – crispy to the point of being crunchy! Rachel and Lorraine both had the mushroom macaroni with ‘slow cooked hen’s egg’. I was pretty jealous because it was delicious! 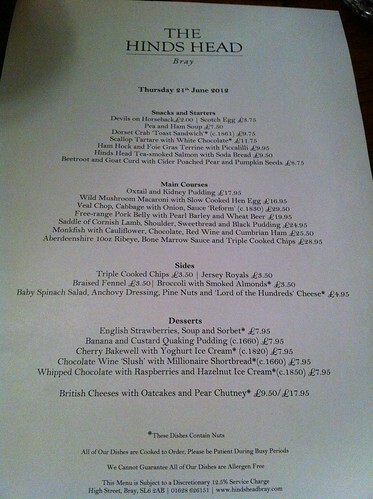 The slow-cooked part for the hen’s egg put me off – I definitely wasn’t expecting it to be soft. 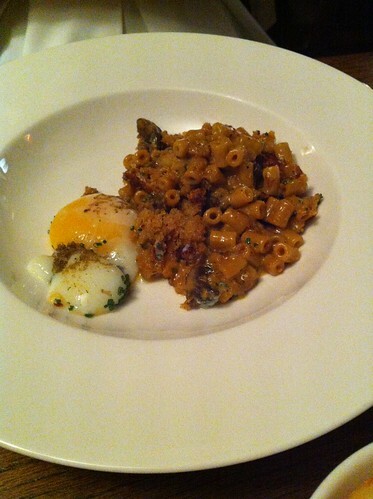 But the deep, meaty, mushroom flavour of the macaroni, and the gorgeous runny yolk was a match made in heaven! 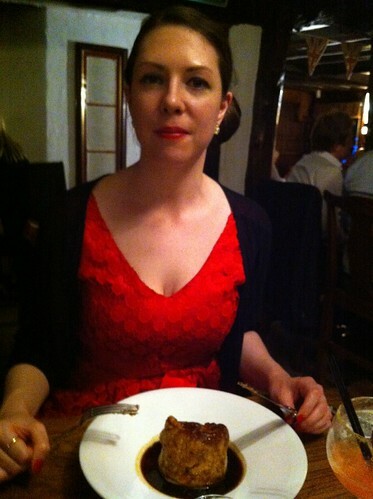 Lorraine tried one of the specialities for her dessert – the quaking pudding! 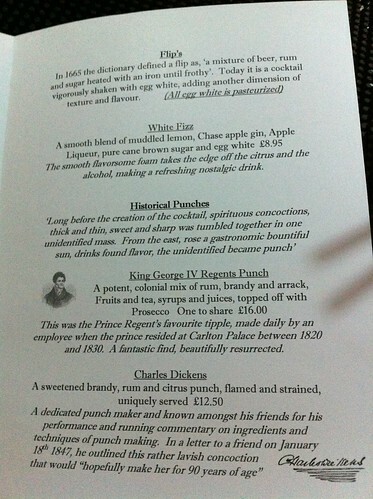 It came with a little piece of card explaining the history of the pudding, which was very light – like a hot panna cotta. 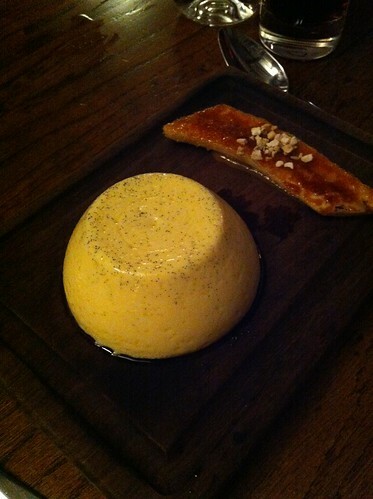 The caramelised banana was a great touch. 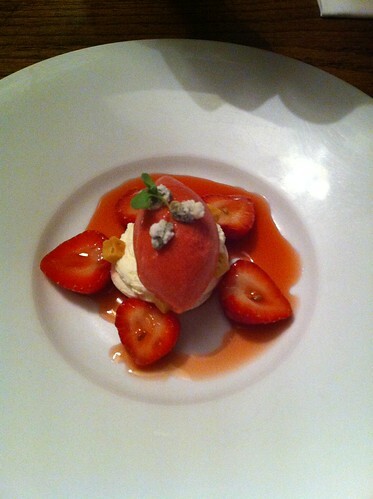 My pudding was called ‘English strawberries, soup and sorbet’, and I partly ordered it because I had no idea what it was going to be! One bite was enough, it flooded your mouth with flavour. Delicious! All in all, our trip was very enjoyable. The food was very rich and full of flavour. It was expensive, but it was worth it for the novelty value! If I went again, it would be to share the experience with other friends and family, because the food, although fantastic, is not fantastic enough for me to justify the price again, nor the journey. 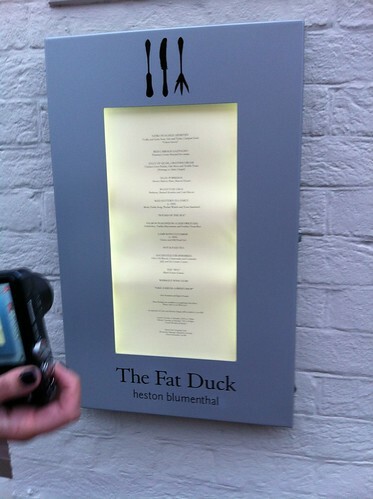 But I would still recommend it to anyone who wants to try Heston’s food without shelling out Fat Duck prices.